The Tampa Bay Rays, who ranked next to last in the majors in attendance last season, are eliminating all seating in the upper deck for 2019 in an effort to create a more “intimate” experience for fans at Tropicana Field. 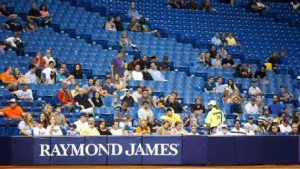 The Rays on Friday said they would add a premium seating section in the lower level but would no longer seat fans in the upper deck, which would reduce capacity at the stadium by more than 5,000 seats to approximately 25,000 to 26,000. 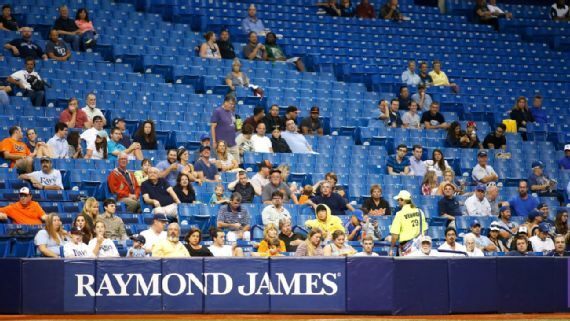 The Rays averaged 14,258 fans last season, ranking ahead of only the Miami Marlins (10,013). It was a 7.9 percent decline for the Rays, who have ranked last in attendance in all but two seasons since 2012. In December, Rays owner Stuart Sternberg said he would reopen the search for a new ballpark site after plans for a stadium in Tampa’s Ybor City area couldn’t be finalized by last month’s deadline. Major League Baseball commissioner Rob Manfred has said the sport will not consider expansion until the Rays and Oakland Athletics get new ballparks. The A’s announced plans on Nov. 28 for a new stadium near downtown and are working to gain approvals. Next Post: Do Cubs have enough to keep up in baseball’s toughest division?